We are grateful to the University of San Francisco for the beautiful gift of the renovated ecological garden and to Greg Smith, motherhouse administrator, for his orchestration of this project. Sister Michele Anne Murphy speaks at the ribbon cutting. 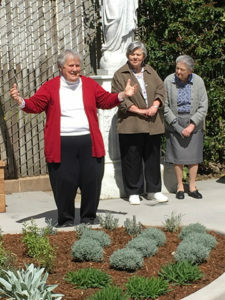 On Saturday, March 24, 2018, Sister Michele Anne Murphy, president of the Sisters of Presentation, San Francisco, cut the ribbon and led us from the motherhouse dining room into the garden. Paul J. Fitzgerald, SJ, president of the University of San Francisco, blessed the garden. The renovated ecological garden features California native plants which are already attracting more birds. There will be an herb garden with mint, sage, oregano, thyme and an area for potting plants and a lemon tree. Best of all the area is wheelchair and walker accessible with plenty of space for sitting and contemplating. Several sisters have already enjoyed their lunches in this new outdoor space and many go to pray on God’s blessings. Sister Michele O’Connell loves that both her family’s memorial benches from the Presentation Center, Los Gatos, were moved here where she can enjoy them.